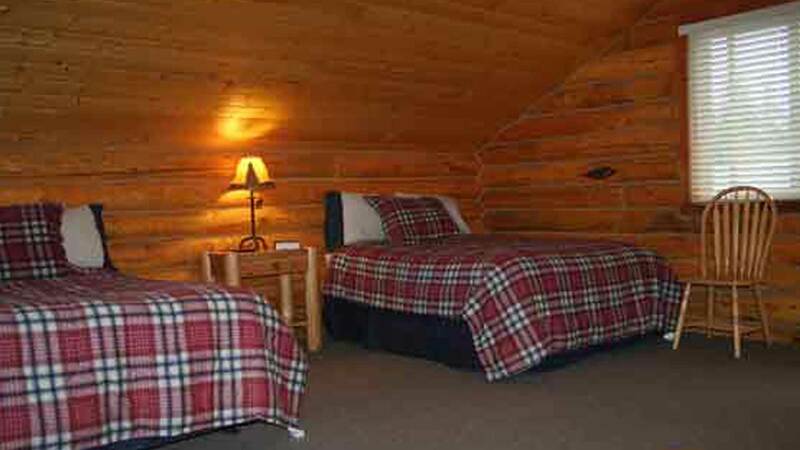 Eagle’s Nest Lodge is located in beautiful Gustavus, Alaska, 50 air miles west of Juneau. Gustavus is only accessible by boat or plane and is known as the gateway to the 3.3-million-acre Glacier Bay National Park. Here, you'll find world-record sized halibut and world-class salmon fishing on the calm, protected waters of the Inside Passage. A 482-pound halibut was landed in this area in 2014; it was not considered a world-record because it was harpooned. The waters around Glacier Bay are rich with salmon and giant halibut. 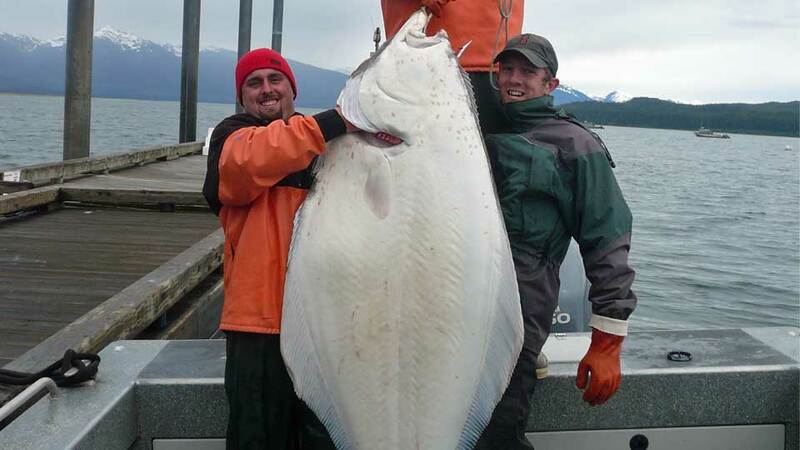 Eagle's Nest Lodge has landed halibut over 400 pounds. 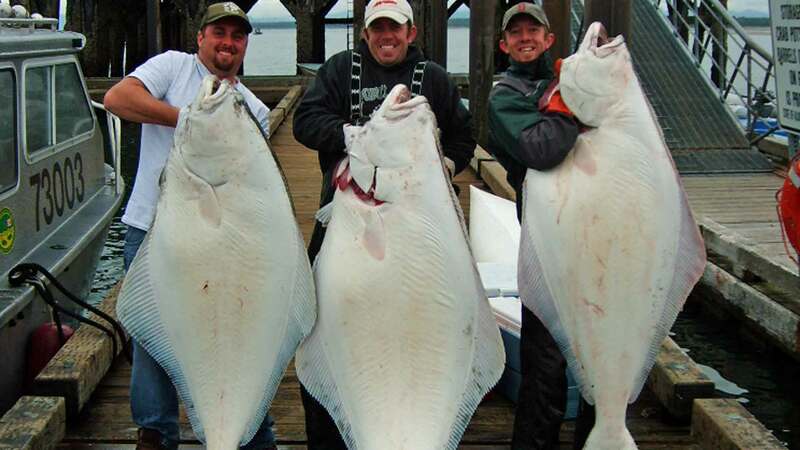 Halibut from 100-300 pounds are caught on a regular basis. Their boats average a 100 pound plus fish per boat, per day. Other species include salmon, lingcod, rockfish and yelloweye also known as red snapper. 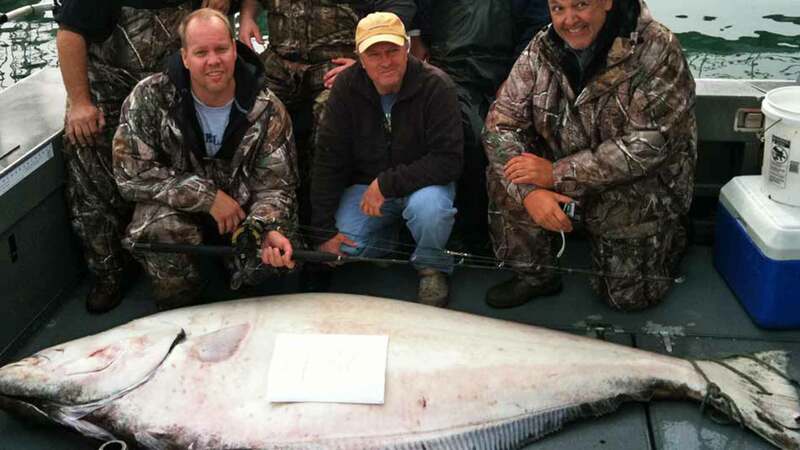 Season: Halibut fishing is excellent here from May through September. 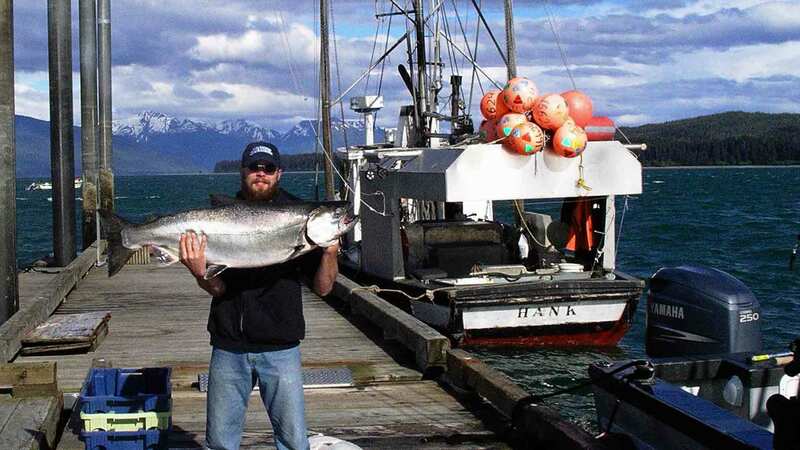 May 20 thru June 30: is king salmon season. Dolly Varden, sockeye, and silvers are in the local rivers. Saltwater Methods: Trolling and jigging. Boats: 28-foot boats with an enclosed heated cabin and a stand-up head (toilet). The boats have a large fish deck and all of the latest electronic equipment. Boats accommodate up to six anglers; parties of four or more may reserve the entire boat. Guides: Knowledgable guides have been with the Lodge for a few years. Travel Time: Average travel time to fishing grounds is 15 to 25-minutes for halibut and 20 to 35-minutes for salmon. Guided Hours: You're guided 8 to 9 hours each day. Equipment: The use of all rods, reels, bait, gear is included in the package. The Lodge has some rain gear and boots available up to size 12. If you prefer to bring your own, please note that felt-soled waders and wading boots are not longer legal footwear in Alaska. Fishing License: Your fishing license is included in the package. Eagle's Nest Lodge is just a short van ride to the marina where the boats are docked. 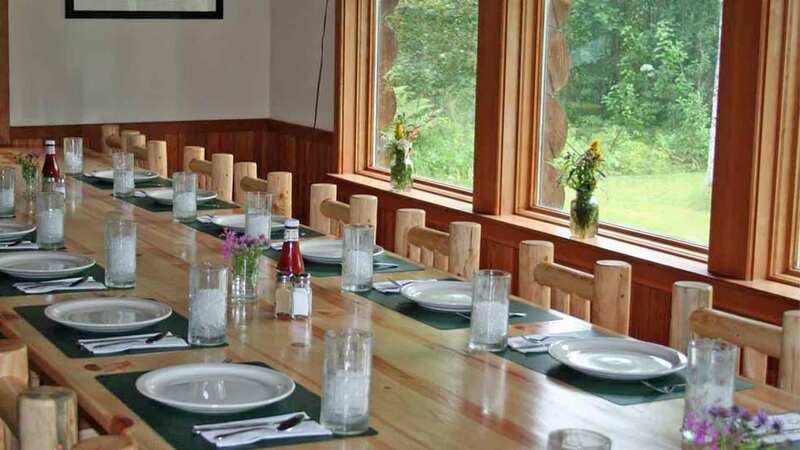 The Lodge accommodates up to 20 guests in seven comfortable rooms. Bedrooms vary from two beds in a room with a full ensuite bath to a 1,000 square foot room with six full-size beds and two full baths for larger groups. 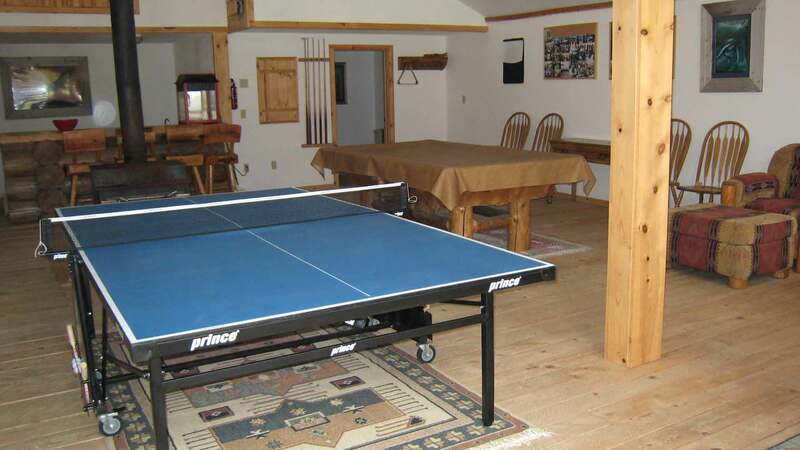 Rec Room: After a long day of fishing, you'll enjoy their 2,000 square foot recreation room with pool table, ping pong table, big screen satellite TV, game tables, board games, Rock Band Hero, a movie-house popcorn popper, and plenty of comfy seating. All of your soda, candy, popcorn, and treats are included. Outside there is also horseshoes and volleyball. 4-G cell service is now available. "This area is arguably the best spot in the world for quality halibut, and they also have access to salmon. We ran to a local hotspot and were able to catch daily limits of kings, before targeting halibut for the remainder of the day. One or more days during your stay, it is necessary to catch bait. We traveled to a cannery operation in the area and then sat just outside their dumping grounds where we jigged for endless amounts of pollack and herring. After filling a cooler, we spent the rest of the day anchored in one of the many various honey holes in the area. 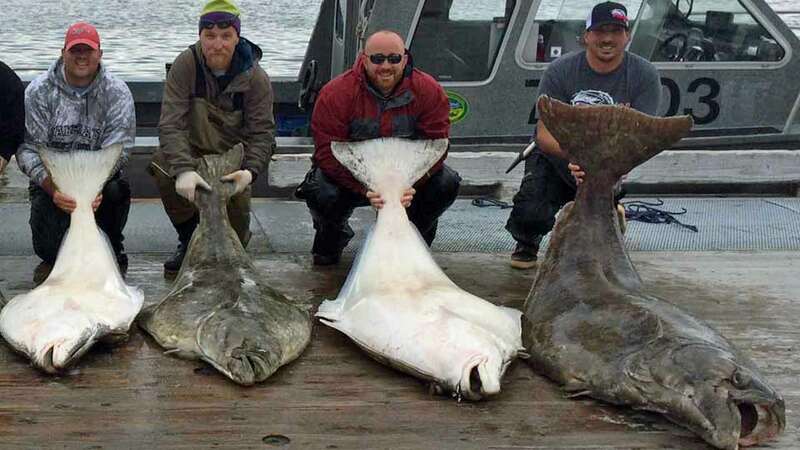 One of the days that we exclusively targeted halibut, we landed some 38 giants. Big bait means big halibut, and if you are up for it, a short wait will typically produce. We had 12 fish one day that were between 90-to 145-pounds, and one giant in the low 200s." From Juneau, Alaska, you'll fly to the town of Gustavus. A lodge representative will greet you at the airport in Gustavus, and drive you to the lodge, about a five-minute drive. There is a 50-pound baggage weight limit for the charter flight and no carry-on baggage is permitted. Hot, cooked breakfasts are served in their large dining room. Mid-day, you'll enjoy sandwiches on the boat (ham, turkey, roast beef, halibut salad, peanut butter and jelly), chips, cookies, candy, sodas, and water. Dinner feature macadamia nut crusted halibut, salmon, beef pot roast, lasagna, chicken cordon bleu... Side dishes, salads, homemade breads, and lastly a variety of desserts. 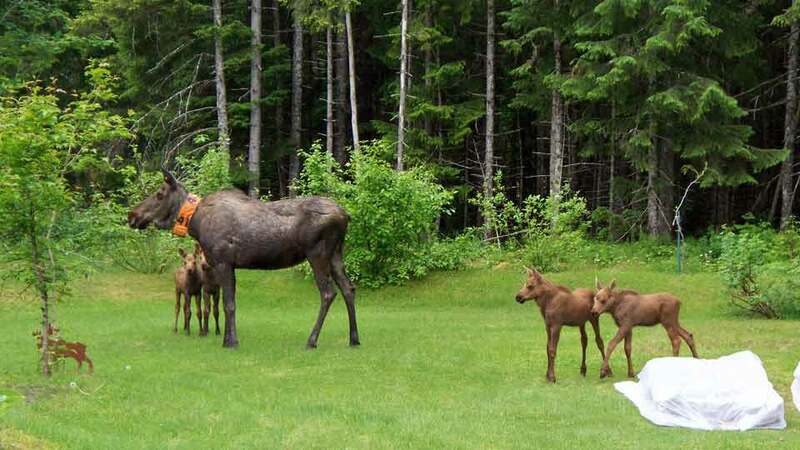 While dining, watch the meadow as moose or even bear may wander through on occasion. Fly-in on Sunday afternoon, fish Monday thru Friday, and fly-out Friday evening. Single-occupancy room with king-size bed, and two anglers per boat. Fly-in on Sunday afternoon, fish Monday thru Wednesday, and fly-out Wednesday evening. Roundtrip ground transfers between the Gustavus airport and the Lodge, lodging, meals, guided fishing, use of rods, reels, tackle, bait, and gear; license, tags, and fish care for up to two 50-pound boxes of vacuum-packed, frozen fish fillets. Airfare, hotels and meals in Juneau or Seattle if required, gratuities, alcohol, and anything not mentioned under inclusions. If Two Anglers book . . . If two anglers book a trip, the Lodge may have to place you/them with another group of three anglers. The cost will remain $3,900.00 per person and lodging will remain double-occupancy. 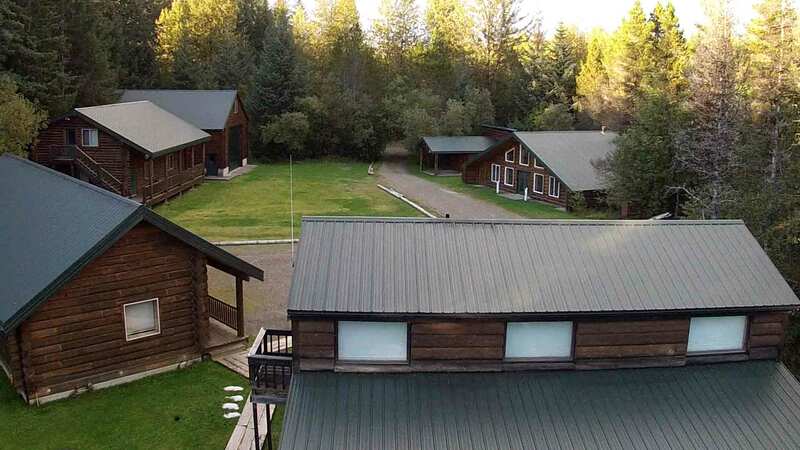 If a group of four anglers books a package, the rate will be $3,700.00 per person with double-occupancy lodging, and no other anglers will be on the boat with your group. A 325-pounder and a 265 in the boat.